How to configure SIP Settings in Nimbuzz Android App | Free Pc to Phone Calls, Free Voip Calls to India International ! Nimbuzz is a very popular instant messanger application, specially for PC. People have been successfully using Nimbuzz PC application to make SIP calls. Thanks to our tutorial "setting sip on nimbuzz Pc client". Its just few simple steps and voila you could enable sip calls on your Nimbuzz PC client. People have asked us about how can they do the similar setup on their android mobile, because they want to make SIP Calls directly from their android mobile. And yes it is possible. Nimbuzz has a client, an application for android mobile phones. The app has many different features, infact it also offers cheap voip calls using Nimbuzz out (where you have to buy some credit). But we are actually interested in setting up SIP settings of some other voip provider in Nimbuzz client and make calls. For example you can configure Pennytel SIP settings in Nimbuzz android app and start making voip calls. In this tutorial we will explain how you can configure any SIP settings in Nimbuzz android app and make calls. Just as like our previous tutorials, we have included images as well. Sometimes it is easy to understand looking at the images, then reading long textual lines! 1. You should know which SIP Provider you are using (viz.. Pennytel, Localphone etc). 3. Click Install and let the application install. 4. Once installed, start the Nimbuzz application. 5. If you don't have an account, create one. If you already have account with Nimbuzz, then just login to your account. 6. Click for Settings and select it. 7. Scroll down to select "Call Settings"
10. Enter all the details like userName, passWord, Domain etc..
12. After everything is done, keep clicking on. (Pennytel in this case will show with green symbol). 13. Dial the phone number with country code. 14. Your call will get connected. We hope that this tutorial was helpful for you. 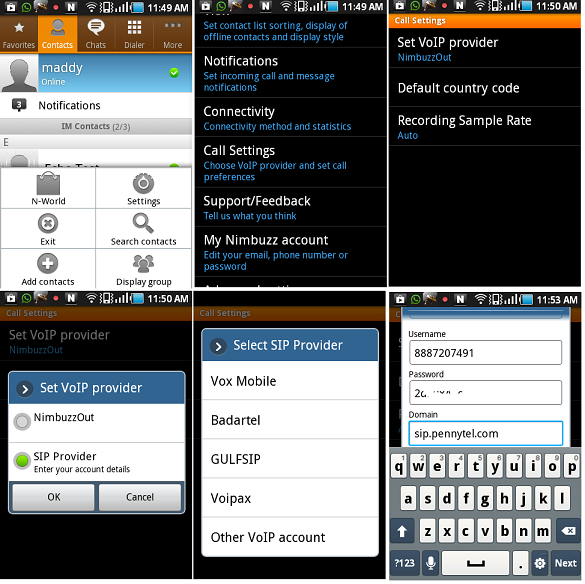 You should now be able to configure SIP settings in Nimbuzz voip client (Android). Similar setup can be used for iPhone or any other phone. Its just few simple steps and you are through. If you face any issues, then you can let us know in the comment. We will try our best to help you out.